In terms of health and affordability, prepping your own meals is the way to go. On average, meal prep can save you 60% of the cost of eating out for a week. But you might be asking yourself: “how exactly do I prep for high quality meals at the lowest price point possible?” We’ve got you covered. Whether your looking to bulk up, lose weight, or simply maintain a healthy lifestyle, you’re going to want to eat high quality foods that are full of essential macronutrients. All foods can be broken down into three basic components of every diet - fats, carbohydrates, and proteins (also known as macronutrients). So what are some high quality foods in each of these categories? These are prime examples of foods that are going to give you “the most bang for your buck” when it comes to fueling your body with energy. On the whole, meats and beans will provide high amounts of protein; grains, fruits and vegetables will provide high amounts of carbs; and nuts, olives, seeds and cheeses will provide a high fat content. Now that you’ve identified which foods fall into your three main categories of macros, we can begin talking about prices. On average, beans and chicken will be your cheapest choice for proteins. You should also consider canned fish (a can of tuna fish averages $1.50 per serving), eggs ($.25 per serving), and greek yogurt (less than $1 per serving). Cheap carbs include oats ($.13 per serving of dry oats), brown rice (averages $.15 per serving), pasta (averages $.25 per serving), and bananas ($.25 per serving). Cheap fats include peanut butter ($.15 per serving), edamame ($.50 per serving), cheddar and mozzarella cheeses ($.25 per serving), and flax seeds ($.16 per serving). A well rounded meal should consist of some proteins, fats, and carbs, but the portions will differ based on your age, gender, body type and goals. For example, a person looking to build muscle might look for high portions of proteins and carbs while a person looking to lose weight may look for a high protein and fat diet. A macro count is based on the number of total calories you consume in a day. For example, if you consume 2,000 calories a day and are looking to achieve a 40% carb, 40% protein, 20% fat diet (a standard breakdown), you would be looking to consume 200 grams of carbs, 200 grams of protein, and 44g of fat per day. This will help make sense of the macros breakdowns you see below. Ok- we’re ready to meal prep for the week! Start by identifying which meals you’d like to make and how many of each. 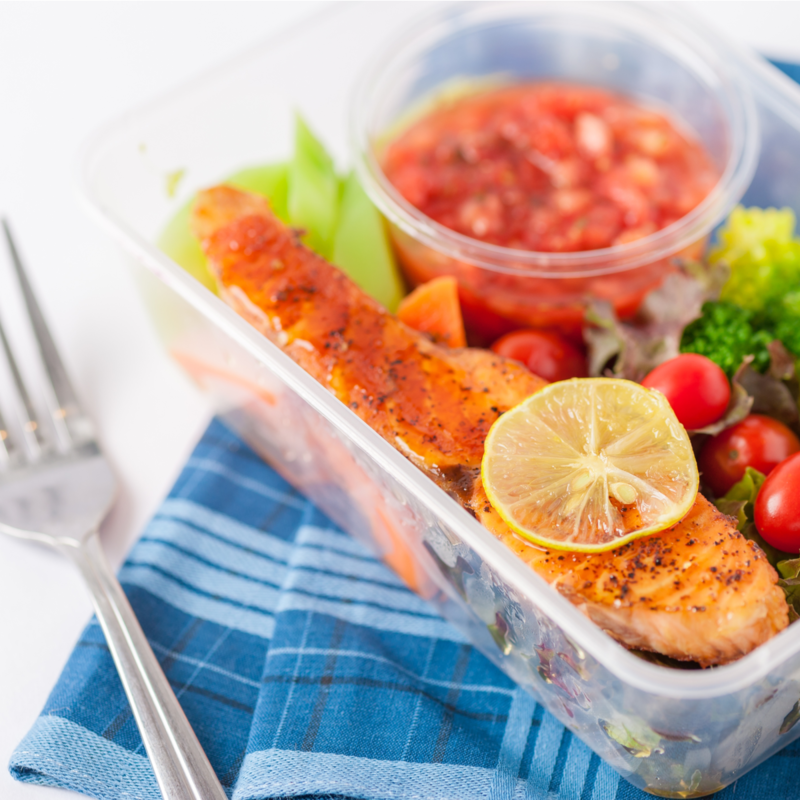 For example, you may want to prep 5 lunches and 5 dinners for the week. Maybe you’d like to prep two or three different meals and have your choice during the week. However you do it, buy in bulk! This will ensure you’re getting the best prices for the amount of food you buy- which will be a lot! Like what you see? Give Eat Rite Foods a try. At just $5 a meal, we specialize in creating high quality, affordable meals just like the ones you see above. And don’t worry about counting macros or figuring out if your meal is packed with the fuel your body needs - we do it for you! Choose from over 19 rotating breakfast, lunch, and dinner menu items in just a few clicks. We’ll even deliver straight to your doorstep. Learn more here!